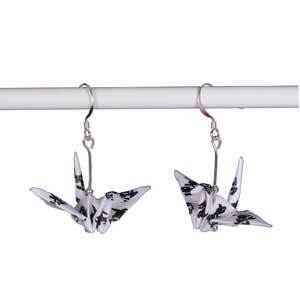 A pair of Origami Crane Earrings - handmade, with Japanese chiyogami origami paper and silver-plated ear hooks and wire. These earrings are made with white paper decorated (handwritten in black ink) with the kanji for love - 愛. The pair of earrings you receive will differ slightly from the ones shown in the image. Although the earrings are coated in varnish, we advise against wearing in the shower or at the swimming pool!